A lorry loaded with hay nearly caused a fatal collision after its driver took a corner too fast. 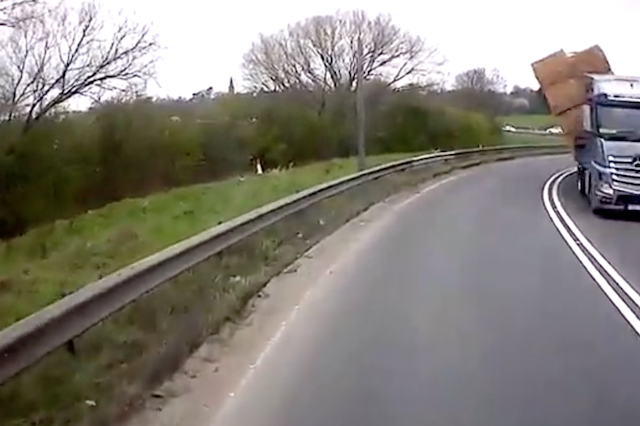 Dashcam footage from another truck shows the offending lorry come around a corner on the A17 in Newark, Nottinghamshire, far too quickly, causing it to lean and nearly tip over. Hay bales that were being transported by the HGV spill off its trailer and land right in front of the Mid Recycling UK truck that recorded the incident. Thankfully, no-one was harmed in the crash, which took place on Tuesday, although the trucks did suffer some damage. A company spokesman told the Daily Mail: "Thankfully there were no injuries, but it was very fortunate. "Had it been a car, rather than one of our lorries, we would almost certainly be talking about a fatality. "There is damage to our vehicle, but thankfully that's the full extent of it, and our driver was fine. "As the footage shows, the driver coming the other way is going far too fast around the corner. "Apparently at the scene he told our driver that it was one of his first trips in one of the lorries. "It sounds like it was a case of inexperience." Police were called to the scene following the crash, and closed the roads causing congestion on the A17 and A1.